Close view of lower half of front façade of the Mehtar Mahal, Bijapur. bl.uk > Online Gallery Home	> Online exhibitions	> Asia, Pacific and Africa Collections	> Close view of lower half of front façade of the Mehtar Mahal, Bijapur. 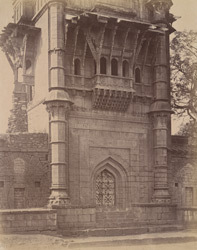 Photograph of the Mehtar Mahal in Bijapur, Karnataka, from Archaeological Survey of India Collections taken in the 1880s by Henry Cousens. The old walled city of Bijapur contains some of the finest examples of Islamic architecture in the Deccan. The Adil Shahi dynasty ruled parts of southern India from the late 15th to the late 17th centuries, with their capital in Bijapur. The dynasty was founded by the governor of Bijapur, Yusuf Adil Shah, of Persian origin, who broke away from the declining Bahmani kingdom of the Deccan. The early 17th century Mehtar (mihtar) Mahal, though modestly sized, is one of the city's most beautiful structures. A gateway leading to the Mehtar Mosque, the graceful three-storey building is surmounted by two slender minarets and covered with delicately carved birds and rows of swans. Balconies projecting over the street are supported on angled struts carved as if they were made of wood.